Before you start trying to teach your bird how to talk, you must first win its confidence. The best way to do this is to help your pet get used to being around you, as well as anyone else living in your home. The easiest time to start taming your bird will be when it is aged between two and six months old, so keep this in mind, because anything older than that takes a lot more time and patience. Fully grown parrots can also be inclined to bite quite hard if you don’t take adequate care – so try not to make any sudden movements that could scare your pet, or it will defend itself by the only means it knows how, which is unfortunately by lashing out. Stroke your pet’s head or give it a very soft scratch to help it warm up to you, while giving it food from your other hand, such as celery, corn, nuts or grapes. You should also give your bird fruit juice or milk from a small drinking cup – but never, ever let it touch your leftovers from a meal when junk food such as meat or anything with a high calorie count is involved. If you are able to use its appetite to your advantage, taming your bird will be even easier. The method is regularly used in bird parks al over the world. When your pet hasn’t eaten in a few hours, simply set the food on a plate near you and encourage your bird to come to you for food. It will undoubtedly be nervous at first, however when it becomes used to this it will be confident when approaching you for food. If your pet is quite untamed when you first acquired it, you should consider putting the cage next to you as you go about your day, doing regular things such as reading, surfing the internet or watching TV. This was it is only a matter of time until your pet gets used to being around you and becomes comfortable. If it is large you can also consider a little gentle rough housing, like with a kitten or puppy, giving it pats and soft scratches around its head and back. It is best to use a towel or gloves at first until it sees you as its master, just to be on the side, until it comes to expect this kind of attention from people in your household. At least once a month you will need to check your pet bird over for abnormalities, including and ingrown nails, feathers or a beak that could need trimming. You will also need to watch out for any possible signs of liver problems, which comes in for form of a dark or swollen abdomen. Gently wash your bird’s legs with warm, never hot, water – this will get rid of any dried on gunk or droppings, then apply vaseline to make your pet’s scales soft and help kill any lice. 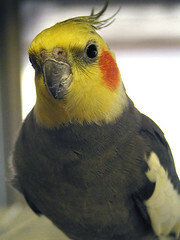 If you are patient and kind to your pet bird you will have a beloved and loyal companion for many years to come.